My nephew needed a new pilowcase for his favourite pillow. I wanted him to have something special and the fact that I call him squirrel gave me an idea. I drew a squirrel on a piece of paper. Then, I cut a piece of white fabric and made use of a pencil, a window, some duck tape and the sun. 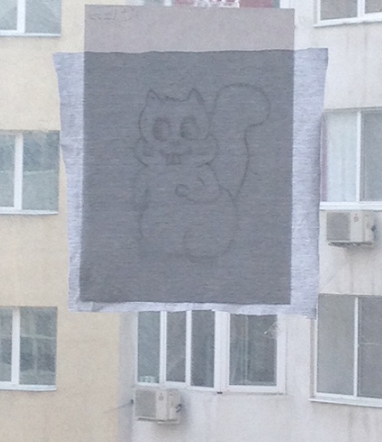 I stuck the drawing to the window by using the duck tape, and the light of the sun helped copy the drawing on the fabric. After coping the drawing, I started sewing by the line. I used only two colors, brown and blue. I followed the steps in the following video http://www.youtube.com/watch?v=4LJnPEvjdDo in order to obtain an envelope pillowcase. After sewing all the parts, as advised, I sewed on the front-side of the pillow the white cloth on which I embroidered the drawing of the squirrel.